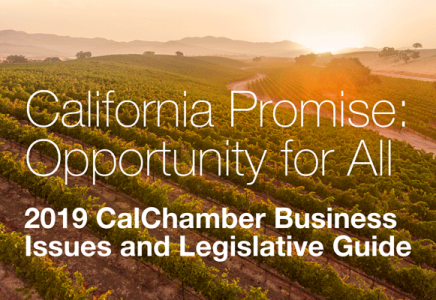 The California Chamber of Commerce remains committed to a continued bipartisan effort to improve California’s green chemistry program with all stakeholders, CalChamber Policy Advocate Adam Regele explained yesterday at a legislative informational hearing. 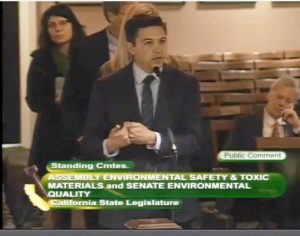 The Senate Environmental Quality and Assembly Environmental Safety and Toxic Materials committees convened to evaluate the effectiveness of this program 10 years after passage of the legislation creating it as the California Safer Consumer Products Program. The committees also reviewed the Public Health Institute’s evaluation of the program, also known as the green chemistry initiative. Although CalChamber agrees with the overall sentiment shared in the Public Health Institute report that the Safer Consumer Products Program is innovative, proactive and scientifically driven, the CalChamber disagrees with some of the conclusions and recommendations in the report. CalChamber has been an active member of the Green Chemistry Alliance, a collection of trade associations and businesses that have been working to ensure effective implementation of the California green chemistry program since its inception and supported bipartisan efforts to create the Safer Consumer Products Program. Coalition members continue to support this regulatory program that proactively and scientifically advances the safe use of chemicals in California. AB 1879 (Feuer; D-Los Angeles), created the Safer Consumer Products Program, requires the state Department of Toxic Substances Control (DTSC) to evaluate chemicals of concern in consumer products and potential alternatives to those chemicals, and to reduce the hazards of chemical in products. SB 509 (Simitian; D-Palo Alto) established a Toxics Information Clearinghouse for data on chemical hazard traits, as defined by the California Office of Environmental Health Hazard Assessment (OEHHA). Developing the complex regulatory scheme to implement the Safer Consumer Products Program took more than five years. Therefore, the efficacy of the program is more accurately judged over the last five years, not 10. Second, CalChamber disagrees that DTSC lacks the authority to collect necessary chemical information from companies, as stated in the report. California regulations outline how the DTSC may request information on chemicals in products through emailed/mailed correspondence and/or information call-ins with manufacturers, importers, assemblers or retailers of a chemical, product or group of chemicals or products. Third, although CalChamber agrees that providing additional staff and resources to DTSC would improve the program’s efficiency, last year’s budget allocated $1.2 million to DTSC for the Safer Consumer Products Program. The benefits of this additional money to the program have not yet been fully realized and are not reflected in the report. Finally, Regele strongly disagreed with the report’s recommendation that the Legislature should once again intervene with chemical or product ban bills that circumvent the work the DTSC is doing under this program. He went on to state that the politicization from one-off legislative chemical and product bans will not lead to safer outcomes and that the Safer Consumer Products Program allows the scientists, not politicians, to dictate which chemicals are safe. Support a transparent process in accordance with the California Administrative Procedures Act.